The fifth-century BC orthogonal city grid is the best-known and most-researched aspect of urban Naxos, the first Greek colonial foundation in Sicily. It was founded in 734 BC by settlers from Chalcis in Euboea and Naxos in the Cyclades and it was completely destroyed in 403 BC by Syracuse. New topographical work at the site was conducted in 2012–17 and the fieldwork was carried out as a three-way collaborative project between the Archaeological Park of Naxos and the Finnish Institutes at Athens and in Rome. The new survey of Naxos integrates what has been previously known about the topography of the ancient town and the layout of the modern city with a first systematic total station survey of the archaeological remains. The seasons in 2014–16 concentrated also on the geophysical survey. The main aim of the project is a thorough revaluation of the whole urban territory. The project directors are Prof. Jari Pakkanen (Professor of Classical Archaeology at Royal Holloway, University of London and former director of the Finnish Institute) and Dr Maria Costanza Lentini (regional director of the Cultural Sites at Catania and former director of the Archaeological Park of Naxos). The geophysical prospection was directed by Dr Apostolos Sarris of the GeoSat ReSeArch Lab of the Institute for Mediterranean Studies of the Foundation for Research and Technology, Hellas. The preliminary preparations for the setting out the new urban plan in the first decades of the fifth century BC involved systematic dismantling of the sixth-century structures. The orthogonal grid counts in every aspect as a re-foundation of the city: it cancelled the original colonial plan and removed all traces of previous urban identities and properties. The second post-460 BC urban phase with attested modifications of the house plans and restoration is best attributed to the return of exiles after the fall of tyranny in Syracuse. The urban space is defined by three wide streets or plateiai (A, B, and C) running approximately in an east to west direction. They are of different widths and at regular intervals intersected by a series of north-south narrower streets, stenopoi (1–14 all together). 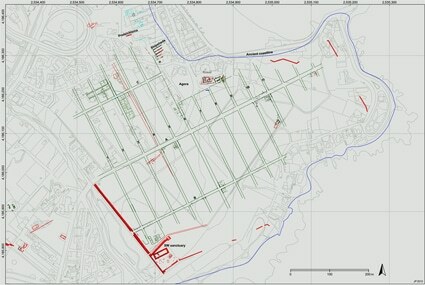 The street network limits the housing blocks of c 39.2 × 156.7 m. Square bases, most likely altars, systematically mark the intersections. Further excavations of plateiai B and C were carried out between 1983 and 1996. The excavations of plateia A, the major axis of the system, undertaken in 1998 continued almost without interruption until 2014: the sector is critical for our understanding of both the formation and development of the city of Naxos. Statistical analysis of the direct measurements from Naxos reveals a simple modular design, which can also be expressed in terms of the so-called ‘Doric-Pheidonic’ foot of 0.327 m. The size of the city block, ca 39.2 × 156.7 m, is 24 × 96 modules, and the designed widths of the streets vary: plateia A is six modules, plateiai B and C and stenopos 6 all four modules and the normal stenopoi three modules. The distances between the centres of the quadrangular bases set in the south-east corners of the cross-roads of plateiai and stenopoi strongly support the notion that they are an integral part of the city design: the north-south distance between the bases is 100 modules and the east-west distance 27 modules. The stenopoi are almost invariably slightly wider than their modular width and the plateiai a little narrower, which suggests that the designed width of the stenopoi was not considered to be quite enough for the expected traffic and that of the plateiai more than wide enough. Compared to fifth-century ‘Hippodamian’ grids, the design at Naxos retains the proportions of the Archaic strip city schemes with long and narrow blocks. The data are consistent with a chronology that the orthogonal city grid was established in the initial decades of the 5th century BC and Paola Pelagatti’s suggestion that Hieron I of Syracuse could have been responsible for the introduction of the new town plan. The new orthogonal grid counts in every aspect as a re-foundation of the city: it cancelled the original colonial plan and removed all traces of previous urban identities and properties. Only the city walls and some of the sacred precincts were left untouched; the monumental shipshed complex also escaped and it was merely fitted into the new urban design. The methods used in the geophysical prospection included magnetic gradiometry, soil resistivity and ground penetrating radar (GPR). During the fieldwork seasons in 2014–16 we surveyed approximately 10 hectares each year. All accessible areas inside the city walls were covered. The results of especially the GPR have been highly encouraging: in most sectors we can see the walls of individual Classical houses which follow the orientation of the city grid predicted on the basis of the excavated parts outside the survey areas. Blank areas in the analyses very likely indicate robbed zones: in some areas the foundation stones have systematically reused to build, for example, modern aqueducts, but partially the recycling has taken place much earlier. Small-scale test trenches were excavated to verify aspects of the city grid and targets identified in the geophysical surveys. Further work in 2017 at the site and store rooms was carried out with the permission of Dr Vera Greco, the current director of the Archaeological Park of Naxos. The project The Greek colony of Naxos in Sicily: mapping the town plan and geophysical survey was financed by the Jenny and Antti Wihuri Foundation in 2013–16, the Foundation of the Finnish Institute at Athens in 2014–2017 and the Finnish Institute in Rome in 2016. The project has also received annual sponsorship since 2012 from Hotel Palladio at Giardini-Naxos.